The general tab covers configuration options that will usually effect all of your panels. Quick: The important options here are to display the 5 man MTs when in LFG so that you can figure out who is your tank (e.g., the warrior or the dk?). The ability to hide empty panels, or even hide VuhDo when you are soloing. Finally, you will be interested in locking your panels so that you can’t move them around your screen. Advanced Set-up: Operation Mode can usually be left alone, but if you are interested in more advanced Health remainder configuration you would look here. Additional operation modes in essence fade out most of the bars except a few that are showing the lowest HP, allowing to isolate more effectively those in most need of healing. The bars can be selected based on a few similar criteria: most HP lost, least HP left, or health percentage left. You can set both the irrelevancy limit above which the bars are faded out as well as max number of players that are to be considered relevant at any given time. Filter allows you to filter out various units from your main VuhDo panel if you’re showing them in separate panels like main tanks or private tanks panels, to avoid redundancy. Hide Panels will hide entire panels when they are empty. If you want to hide specific units within a single group when you only have two people in it, goto Panels (General) Ordering-Hide empty. Lock Panels is highly recommended once you’re done fiddling with the settings. Accidentally dragging the panels during a fight can lag you out for a few seconds and send your raid window off somewhere into a corner. You have the option to lock them only during the fight if you prefer to fiddle still with the positioning between the pulls. Quick: Leave these options alone. Advanced Set-up: Under Range, you will want to choose the spell with the shortest range, so that you can see at a glance who is not in range of your heals because they will be faded out. You can set options to also see the distance shown as a number. You can make the arrow less or more intrusive (adjust size, appear only on dead players or always appear on target regardless of range). Note that these distances are approximated from map coordinates and require some major calculations on the part of Vuhdo. If you’re playing on a laptop and are struggling with your FPS, turning this off would be one of the first things to do if you’re trimming vuhdo down. Global Scanners covers update frequency and range for hots/debuffs/effects etc. 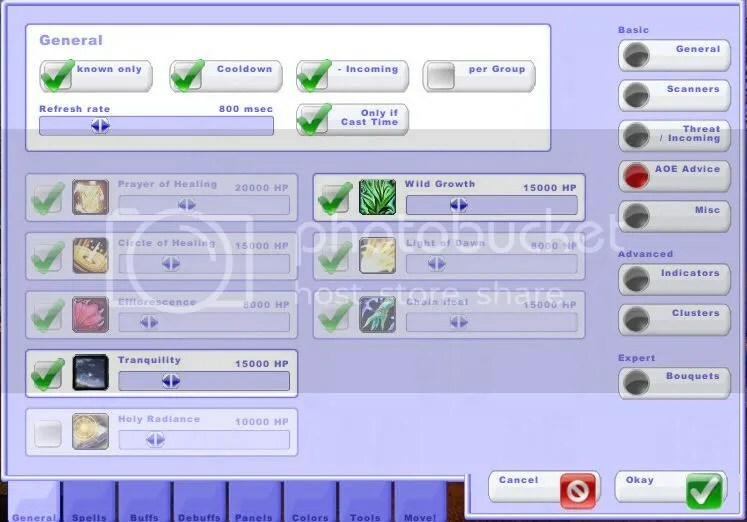 Talent Trees option enables you to improve accuracy of raid role assignment. It will help with wrong assignments in classes like druids or dks for example. Enabling Parse under Combat Log is an internal vuhdo function for parsing combat log in order to provide smoother and faster health updates. Advanced Set-up: Incoming Heals are important to monitor as a healer, so unless you have serious performance issues you should have those turned on. Under Check for Aggo, Tank Mode will only watch the aggro for threat detection and ignore enemies occasionally targeting players (such as caster mobs). When you’re tanking, you don’t want to be seeing raid members getting aggro from a random cast and wasting time trying to taunt the mob off of them when the mob can’t be tanked. The Text option will mark a player getting aggro with brackets or symbols, which is nice for having a quick reaction to people who are going to be taking damage immediately. Advanced Set-up: Instead of showing how many people were in range of any particular raid member in the Clusters section, it selects only one “best” target for your smart heals such as Wild Growth. I recommend leaving Known Only checked, otherwise it will track every aoe spell listed, whether you have that spell or not. Sliding the refresh rate to a low number is a sure way to lower your framerate so make sure you are aware of what you’re doing if you adjust it. If you want to see the aoe heal target predictions only when the spell is off cd (if the heal has a CD), you can check that here as well. The sliders for lower limit on HP of your heals can be adjusted according to what your stats are and how much your heals hit for. Quick: I recommend selecting Party under Hide standard and enabling Announce Resurrection, but these options could be left alone if you need a quick install and go. Advanced Set-up: Under , if you already have a Unit Frame addon that does this for you, you can leave these settings blank; otherwise hide them. If you want to announce who you are rezzing, you can do that here under Announce Resurrection. If you want to change the text, just be sure to use vuhdo in the place of the target’s name. I don’t use the Global Cooldown feature, but it adds a nice little cooldown bar that lets you see instantly when the global cooldown is up. 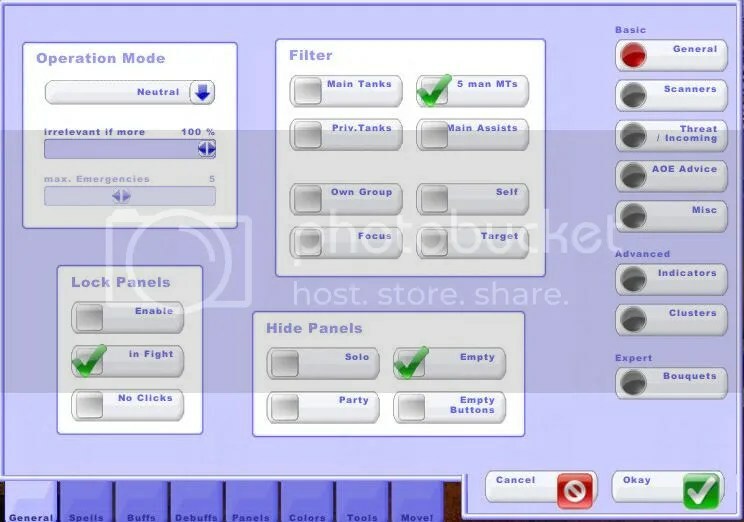 If you use Clique and/or Masque/Bartender then you would be interested in the options under Custom Addons. The D/C Shield feature uses macro slots to try to recreate the frames for you immediately after you log back in the middle of combat after a D/C. If you’re a stickler for macro space, and this happens rarely to you, check D/C shield to turn the feature off. 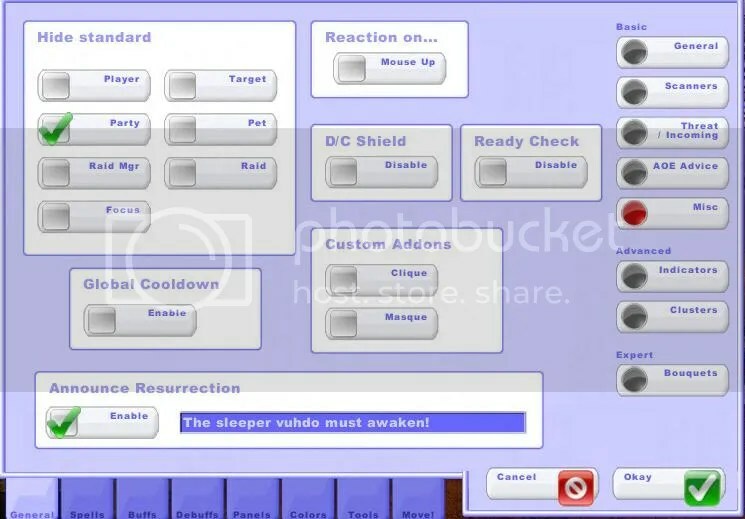 Then, to recover your raidframes after you dc, do a /reload UI instead. Advanced Set-up: This provides more flexibility for how you display information intrinsic to the Vuhdo frame. A typical ajustment might be your Aggro indicator as there is an “Aggro Line” option. I personally tend to specifically configure Mana Bar for Manabars: All Powers. You can also select a Custom Bouquet for your indicator (more about Bouquets below). Additional functions can be found under “More” next to the indicator you’re modifying. For example, in case of Health Bar indicator, this will contain options to invert the bars (bars grow as health decreases), change axis to vertical (bars will grow/shrink in vertical direction) or flipped (direction of growth changes from right to left). Advanced Set-up: This will provide configuration if you find you need to adjust at what health level you want “Clusters” to show up. Additionally, the range slider allows you to change the range depending on your talents or glyphs and the health level slider adjusts when you want to see clustering. Source/destination offers options depending on the mechanics of your aoe spell. You need to adjust this to your type of aoe heal. For example CoH is cast on any target (not myself only) and it affects entire raid (not limited to group like PoH). The downside of clustering is that you can set it up only for one type of heal (eg. smart/group/reticle defined/cone). If you have more than one type of aoe heal this can be a problem. Therefore when you’re setting this up, you should pair it up with the display under AoE Advice above. Advanced Set-up: The basic idea is that this gives you a section to change just about any setting and the way just about anything is displayed. 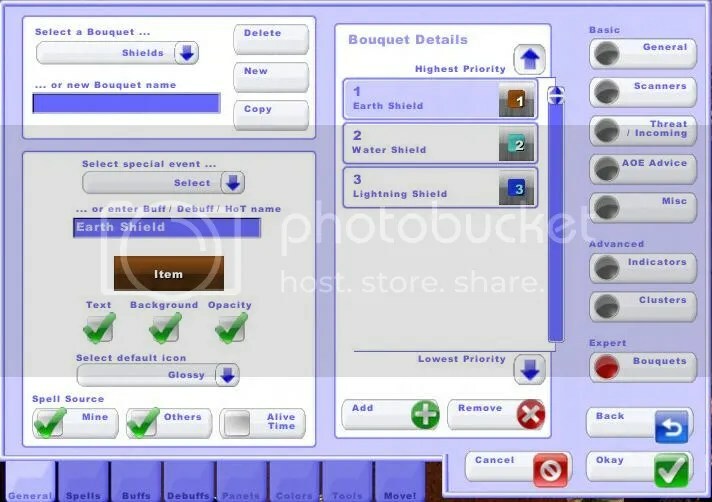 This is where you can add your own Bouquets if you do not want to use solely the ones already provided. The image above is a sample Bouquet I created to track Shaman Shields all in the same corner (since only a single shield can be on a target at one time). First, under …or new Bouquet name, give it a name and select New. Then under …or enter Buff/Debuff/HoT name enter the spell name (be specific) and select the Add button at the bottom of the next panel. Do that for all three spells and you can track them as described later in this Guide. Additionally, the preset Bouquets for Role Icons, Alternative Powers, Statusbar: Always Full and Statusbar: Full if Active are worth exploring as they provide some powerful additional configuration. This entry was posted in Design and tagged Guides, UI, VuhDo by Makakai. Bookmark the permalink.